The Ramsey's Draft Loop is beautiful with ridge line valley views, springs and streams but is tiring with long ascents and knob traverses on the 11.0 mile first day. 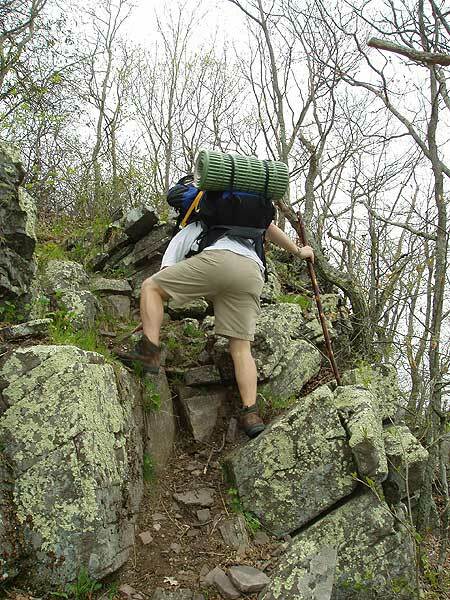 Unlike most ridge trails the Bald Ridge Trail is a long series of ascents and descents of six knobs. 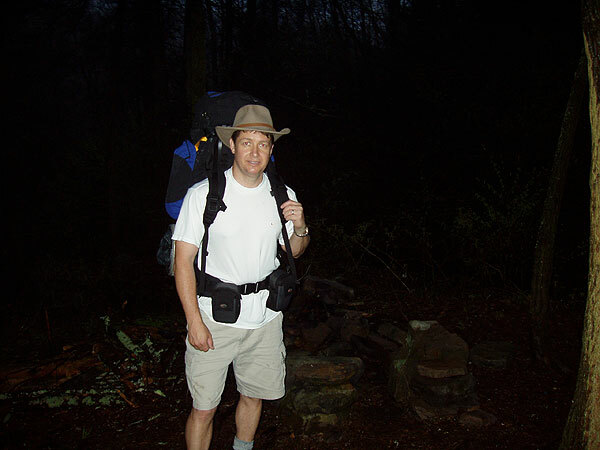 It is 6+ hours of hiking to one of several great camp spots anywhere from Hiner Spring and below. 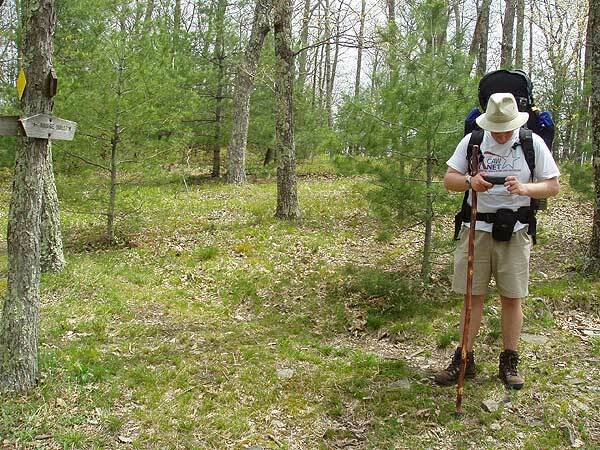 Also note that some portions of the trails are hard to spot and not well marked. 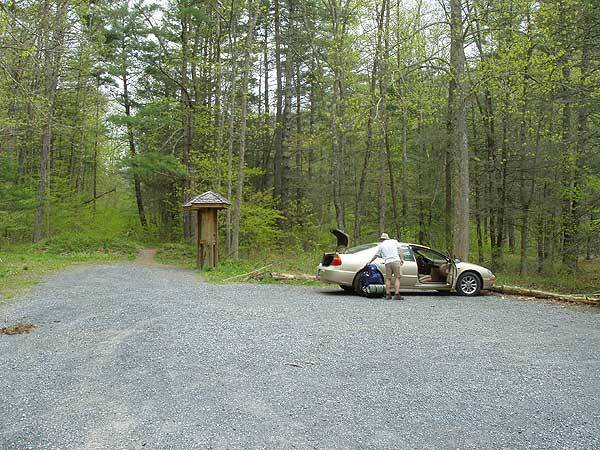 Start out at the end of the parking lot for 150 yards then turn right where a trail will cross Ramsey's Draft. 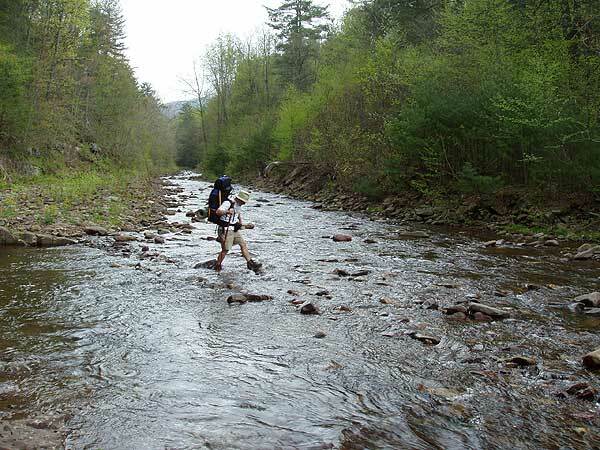 We needed to go about 50 yards upstream to find a low water spot to cross. Follow the trail as it begins to ascend the mountain for the longest steepest section of the loop as it winds up to the ridge in 2.0 miles. At the ridge turn left as the trail you have been following now continues down the other side of the mountain. 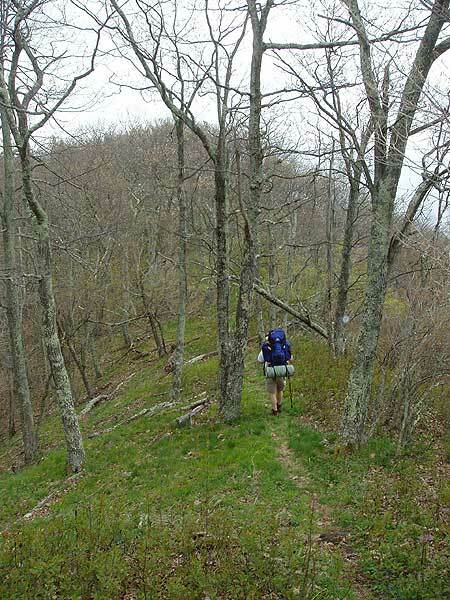 Follow the ridge trail 4.5 miles (yellow diamond marked in places) as it crosses The Peak, Bald Ridge Knob, The Pinnacle and Gordon Peak before arriving at the next trail junction. 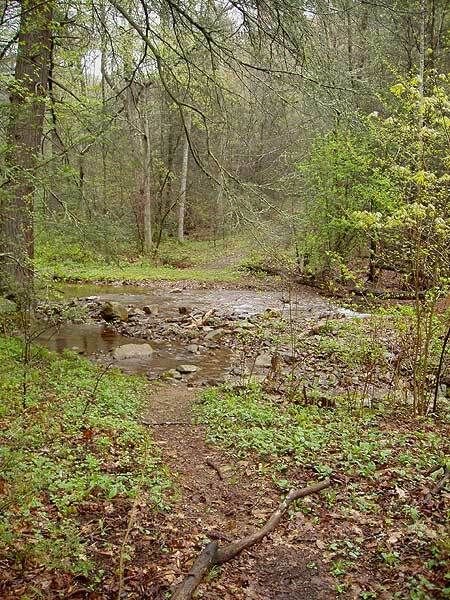 There is a small clearing with a trail coming in from the right and pond to your left. Continue around the pond on the right side where the trail continues uphill, then descends and in 1.7 miles arrives at the next trail junction. Turn hard left at this junction and gradually ascend for 1.3 miles to arrive at Hiner Spring. There are several good camp sites here. Turn hard left downhill staying to the left of the stream down the valley (the trail does not become apparent for about 150 yards as it passes over rocks). 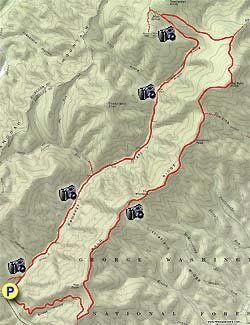 In 0.3 miles you will pass several great camp sites. Choose one for your camping spot. Continue down the trail as crosses the steam and in 0.4 miles turns more to the right. For the next 3.0 miles you will cross Ramsey's Draft several more times before arriving at the intersection of the Jerry's Run Trail that comes in from the right.Cross the draft again continuing down the trail as it crosses back and forth several more times for 2.1 miles where you will arrive at the next rail intersection. Stay left continuing next to the draft for the remaining 0.1 miles back to the parking area. Planned on doing this hike as described as an overnighter but ended up doing the whole thing in one day. Unfortunately the rainy forecast was not intermittent rain like I had hoped, but constant, steady rain the entire day. 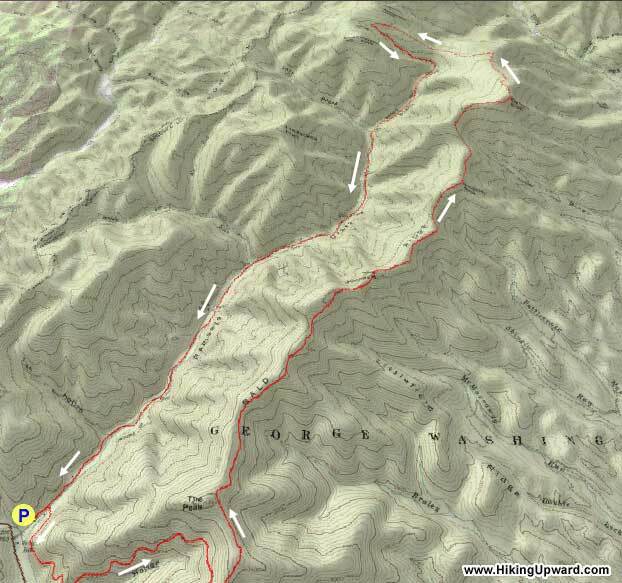 In thinking about the overall experience, I am trying to keep in mind how the hike would have been with good weather. 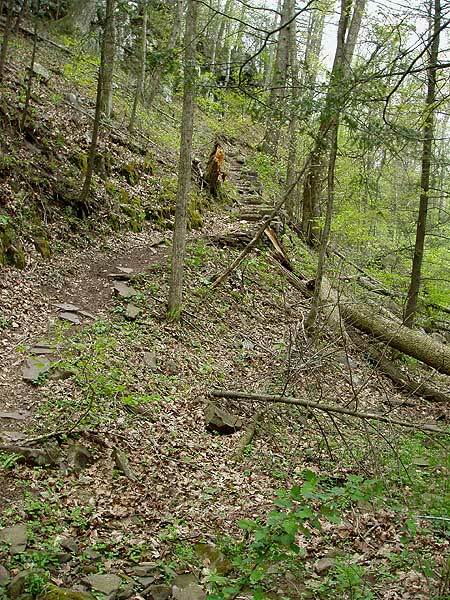 The trail conditions on the 2.2 miles of the Bridge Hollow Trail was 5/5. This section contains most of the uphill. Shortly after turning left on the Bald Ridge Trail, there was a nice campsite with plenty of room with a nice view. Trail conditions quickly deteriorated after that. 90% of this trail is stinging nettles or thorns. I would give this trail a 1/5. This section of the hike is the easiest to get lost. The other campsites (with the exception of the last one by Big Bald Knob) on this ridge have little or no room for a tent. The Hiner Spring trail conditions were better, maybe a 4/5. Hiner Spring had a ton of room and was really nice. As others have said, be attentive leaving Hiner Spring to keep the trail. The posted directions help. The Ramsey's Draft Trail had stinging nettles and thorns making up 95% of the trail. There are lots of blowdowns. These make it slow-going. 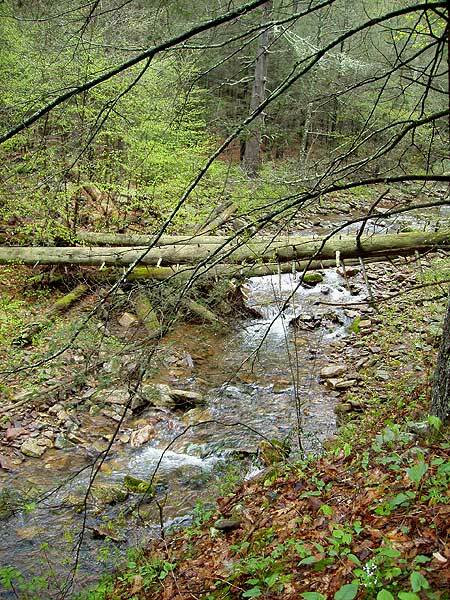 Then there are the stream crossings. I kind of liked them, but again it makes it slow. You WILL be walking with soaked shoes and socks for 6+ miles. Trail conditions 2/5, but overall it was a cool experience being in / near the stream. If you're going to do this hike, you MUST wear pants. Your pants will be wet the entire Ramsey's Draft Trail. 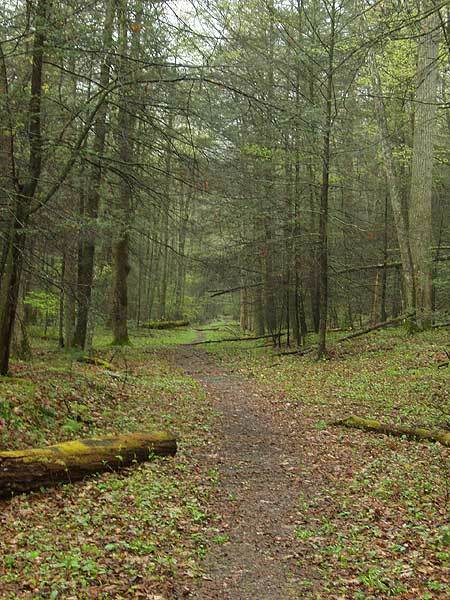 Like other wilderness areas, the trails are overgrown and portions are very faint. With good weather this might have been a 3/5, but trail conditions just cause it to be more tedious than enjoyable. I'm not even sure it would be better in winter since I think the trails would be more difficult to follow. 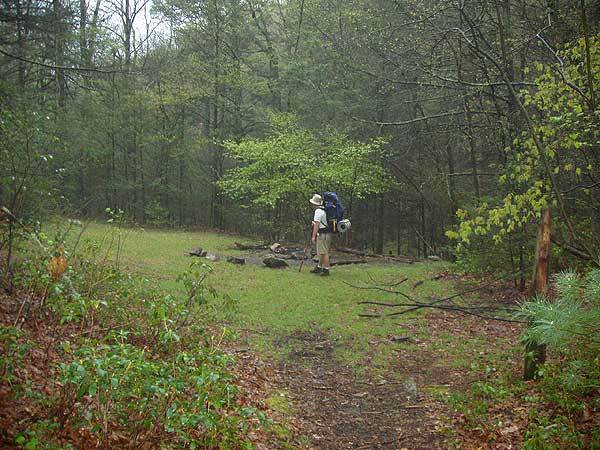 We did the twin of this hike on the West side - came up the draft, camped at Hiner Spring, and then continued on to the Shenandoah Mt. trail before heading back down via the Road Hollow trail. The draft itself was still flowing well, so we had to ford most of the crossings - there are so many that it would have taken forever to remove shoes every time, so we just forded in our shoes and walked with wet feet. I think the deepest crossing was about thigh-deep on me (I'm 5'11"). Parts of the trail had lots of blowdowns, so it could be very tiring to maneuver. Also not sure I would hike it much later in the year, because the weeds were already growing up along the trail. Lots of poison ivy too. Camp site at Hiner was nice, although lots of bugs! Plenty of water, and we shared the large site with three other people. Not much in the way of views the 2nd day, but still a pleasant ridge walk with a couple of glimpses here and there. I'd love to come back earlier in spring to do the Bald Ridge trail too. I did this hike counter-clockwise, as suggested. The ascent really isn't that bad, and the views from Bald Ridge are quite lovely, especially this time of year when the trees above 3500 feet haven't yet leafed out and many spring flowers are in bloom. It's true that the Bald Ridge trail isn't very well marked, but the trail is pretty obvious in most places (this might not be so true during fall and winter), and you basically just need to follow the ridge line. I made it to Hiner's Spring in just under 5 hours and wound up camping there. 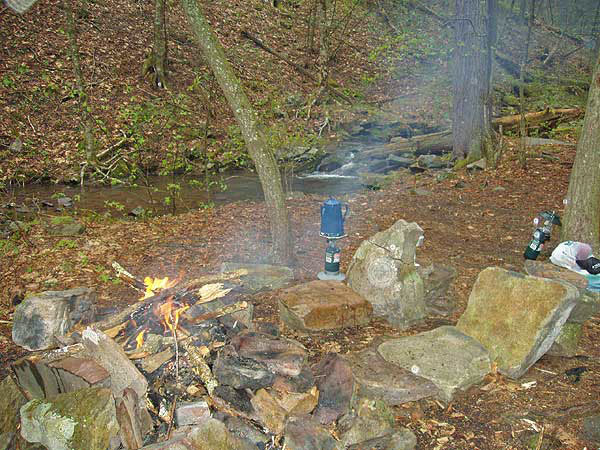 Plenty of water and some very nice campsites. The next day, I descended the draft. 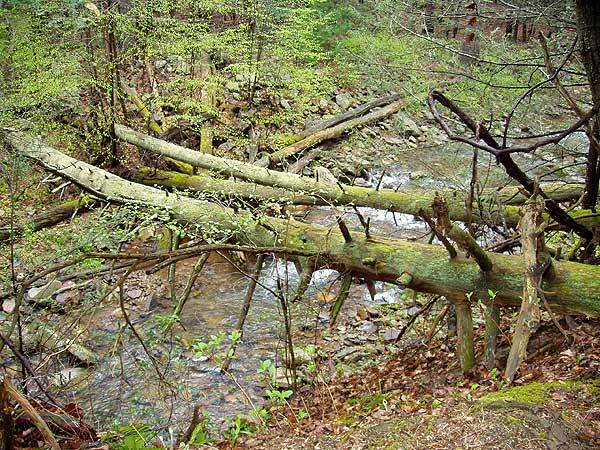 The remains of the hemlock stand are truly a site to behold, at once awesome and sad. Many of the dead trees must measure five to six feet in diameter at the base, and I would guess that some of the ones that are still standing must be over 100 feet tall. This forest must have been truly amazing when the hemlocks were still alive. Ramsy's Draft itself is a beautiful stream although it wasn't very high, you basically have to get wet the crossings are so numerous. I did quite a bit of fly fishing on my way down and caught several gorgeous six to eight inch brook trout. One note of caution: although the nettles and poison ivy were not a problem as they had just started growing, there are portions of the trail along the stream where they grow right up to the trail and will soon probably be in the trail, so if you hike this trail during the summer, wear pants. Oh, and I also saw a big rattler right along the trail, but it rattled at me well well before I saw it. All in all, this is one of my new favorite hikes in the region - a truly unique and wonderful place! We are old buggers so hiked up the Ramsy's Draft side (ie clockwise) as far as Jerry's Run - multiple crossings, so advice is take good water shoes and keep them on. 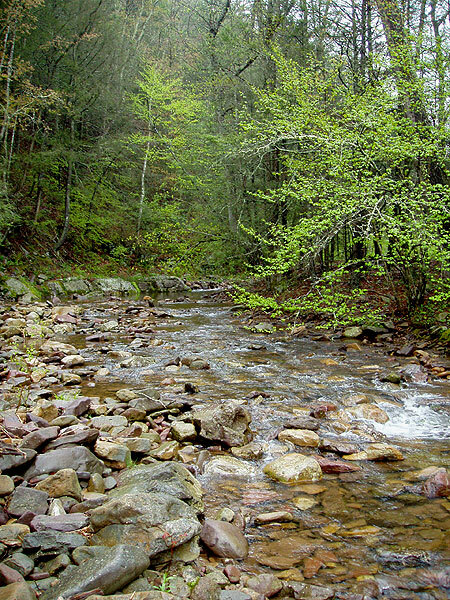 Jerry's Run no fording, walked to site of old hikers cabin, good camping, lots of room, is about 1/2 mile from Shennanodoah Mountain Trail. Left our tents there and day hiked up Shennanodoah Mountain Trail - noted camp sits at intersection with Sinclair Hollow Trail and about 1/2 mile north of that (there is a spring just across the trail from this site). Coming back we came walked the last bit of Jerry's Run then left down Shennanodoah Mountain Trail leading to Road Hollow Trail which joins Ramsy's Draft Trail right at the bottom, 1/4 mile from parking lot, and is a nice, steady trail with no water crossings. Did this as a day hike last weekend. Hiked it counter clockwise as I wanted to come down the Draft instead of up it, which turned out to be a good idea for one reason. I saw absolutely not a soul on this hike the entire day. I parked in the parking area and there were maybe 10 vehicles there but I believe most people hike up to Hiner Springs via the draft and back, so this explains why I saw no one. So once you come off of the bridge hollow trail and head up the bald ridge, there were two spots where the trail just disappeared and I went off trial twice. Do not expect to see ANY yellow tree tags after about 2 miles up the bald ridge. All I can say is keep following the ridge line and you should be fine. Great views up there along the ridge which I would imagine would get obscured once the leaves start to show up. All around it was a good hike. The Draft had the highest flow on it that Ive seen so far. Actually had to put on my water sandals to cross the last 6 times or so. Also, I only counted 17 crossings of the Draft. Another note is when you come to Hiner springs and either start up or down keep the draft to your left going down and to your right going up and you should be fine. The trail is very obscure in this area. ENJOY! !